Transitional cell carcinoma of the bladder is a common urological cancer in developed countries. There are two categories of bladder cancer (BC): superficial (low-grade; nonmuscle-invasive BC [NMIBC]) and invasive (high grade; muscle-invasive BC [MIBC]). NMIBCs may relapse locally but development infrequently while MIBCs often develop rapidly and have a poor prognosis. Most of the low-grade BC are treated by surgical removal with transurethral resection of bladder tumors (TURBT). However, due to its high recurrence rate, the use of intravesical agents such as mitomycin C and Bacillus Calmette–Guerin (BCG) is the standard procedure for treating superficial BC. During the past 2 decades, the 50% overall survival at 5 years has not improved because of the limited treatment options for BC. Therefore, novel therapeutic approaches are warrant other than the neoadjuvant platinum-based chemotherapy which did not significantly improve the overall survival of BC. Quercetin (3, 3′, 4′, 5, 7-pentahydroxyflavone), a natural flavonoid molecule, is an antioxidative compound ubiquitously distributed in fruits, leaves, and grains in plants. It has anticancer effects which are linked to the capacity for targeting tumorigenic pathways by its antioxidative activity, inhibition of carcinogen-activating enzymes, modification of signal transduction pathways, and interactions with receptors and other proteins. Quercetin has been demonstrated to enhance water transport in toad bladder. By suppressing the expression of P53 and Survivin proteins, quercetin inhibits cellular growth and induces apoptosis in BC cells. It has been shown that quercetin increases the expression of Ca-activated K channel proteins to inhibit the growth of BC cells. More recently, quercetin was demonstrated to alter the extracellular catabolism of nucleotides, resulting in the accumulation of AMP. Su et al. took one step further by showing quercetin induces apoptosis by activating 5'-AMP-activated protein kinase (AMPK) signaling in BC cells. Macroautophagy (autophagy) is a highly conserved catabolic process which degrades damaged cellular organelles and misfolded protein to maintain cellular homeostasis when cells are under metabolic stress and nutrient deprivation. The Novel Prize in Physiology or Medicine was awarded to Professor Yoshinori Ohsumi for his discoveries of autophagic mechanisms. Accumulating studies have demonstrated that cancer cells induce autophagy against anticancer treatment by evading apoptotic pathways. Therefore, targeting autophagy becomes a novel approach to enhance the efficacy of anticancer agent in various types of cancer. For example, our previous studies demonstrated that inhibition of basal autophagy or anticancer agents-induced autophagy enhanced the apoptotic cell death in BC cells.,, It has been demonstrated that several signaling pathways involve in the regulation of autophagy. The mammalian target of rapamycin (mTOR) that governing the protein expression in cells is the major regulator to inhibit autophagy in a nutrition-rich condition or the presence of growth factors' signaling. In contrast, AMPK that responses to low energy or nutrient deprivation control autophagy induction. Recently, Su et al., reported that quercetin-induced apoptosis in BC cells by activation of AMPK signaling. Therefore, it is reasonable to hypothesize that quercetin may induce autophagy through AMPK activation. Here, we address the question of whether autophagy is significantly linked with quercetin-induced apoptosis in human BC cells. We reevaluated the induction of cell death by quercetin at various concentrations and incubation times and investigated the role of autophagy in quercetin-induced apoptosis in p53-mutant 5637 and T24 cells, with the aim of exploring the effective anticancer activity of quercetin. Our results demonstrate that quercetin induces reactive oxygen species (ROS)-mediated autophagy in these BC cells, and suppression of quercetin-induced autophagy further enhanced quercetin-induced apoptosis. Thus, inhibiting autophagy may be considered as a novel therapeutic approach which sensitizes cells to quercetin treatment to reduce BC proliferation. All the cell culture reagents including RPMI 1640 medium, fetal bovine serum (FBS), penicillin/streptomycin, and nonessential amino acids were purchased from Thermo Fisher Scientific (Waltham, MA, USA). All the chemicals including quercetin were obtained from Sigma-Aldrich (St. Louis, MO, USA) unless otherwise stated. Primary antibodies against LC3, p-62, AMPK, p-AMPK (Thr172), mTOR, p-mTOR (Ser2448), p-mTOR (ser2481), and Beclin-1 were from Cell Signaling Technology (Danvers, MA, USA). Primary antibody against β-actin was from Sigma-Aldrich. The APO-DIRECT kit was acquired from BD Biosciences (San Jose, CA, USA). A Pierce BCA protein assay kit was purchased from Thermo Fisher Scientific; and polyvinylidene fluoride (PVDF) membranes and ECL chemiluminescence kit were from Millipore (Bedford, MA, USA). Human transitional cell carcinoma cell lines 5637 (ATCC#HTB-9) and T24 (ATCC#HTB-4) were obtained from the Bioresource Collection and Research Center (BCRC; Hsinchu, Taiwan) and cultured in RPMI-1640 medium. These cells have performed STR-PCR profile at BCRC and were maintained at 37°C under 5% CO2 as described. Media were supplemented with 10% FBS, 2 mM GlutaMAX-1, 100 units/ml penicillin, and 100 μg/ml streptomycin. Cells were treated with the indicated concentrations of quercetin while control cells received an equal volume of dimethyl sulfoxide (DMSO). The final concentration of DMSO was <1%. The effect of quercetin on 5637 and T24 viability was determined by the WST-1 reagents as described. Briefly, cells were seeded in 96-well plates for 16 h before the treatment of quercetin. The medium was removed, and 100 μl of complete medium with various concentrations of quercetin was added and incubated for 24, 48, and 72 h. After the treatment, the medium was refreshed with 100 μl of complete medium with WST-1 reagents per the manufacturer's instruction. The cells were incubated at 37°C for another hour; then the plates were read immediately at 440 nm with a reference wavelength of 600 nm on an Epoch plate reader (Biotek Instruments, Inc., Vermont, USA). Data were present as the percentage of control. All results were assessed in quarto duplicate at each concentration. In some experiments, cells were pretreated with 200 nM bafilomycin A1 (Baf A1) or 1 mM Z-VAD-FMK for 2 h before the administration of quercetin. The apoptosis induction in cells treated with quercetin was accessed by (a) the activities of caspase 3/7, (b) DNA fragmentation, and (c) the proteolytic cleavages of caspase 3 and poly (ADP-ribose) polymerase (PARP). For the detection of caspase 3/7 activity, a synthetic substrate (Z-DEVD)2-R110 (Bachem, Torrance, CA, USA) was utilized as described. Briefly, cells after treatment were lysed directly by adding caspase 3/7 assay buffer containing the substrate, and the lysates were incubated at °t for 1 h. The fluorophore R110 released proteolytically from the substrate was then measured using a fluorescent plate reader (Victor X2, PerkinElmer, Inc., Waltham, MA, USA) at an excitation wavelength of 485 nm and an emission wavelength of 535 nm. For the measurement of DNA fragmentation in quercetin-treated cells, a BD APO-DIRECT™ kit (Becton Dickinson, BD; NJ, USA) was employed per the manufacturer's instructions. The level of DNA fragmentation was detected using an Accuri C5 flow cytometer, and the data were analyzed using the built-in software (BD). To detected the cleaved caspase-3 and PARP, total protein from the treated cells was subjected to the immunoblotting procedure as described. In some experiments, cells were pretreated with 200 nM Baf A1 for 2 h before the quercetin treatment. Autophagy induction in quercetin-treated cells was detected by the procession of LC3-II autophagic marker protein as described. In brief, cells subjected to the indicated treatments were harvested and lysed, and the protein concentration was determined by a BCA protein assay. An equal amount of protein was separated by sodium dodecyl sulfate-polyacrylamide gel electrophoresis and transferred to PVDF membranes. The membrane was probed with antibodies against LC3, and the subsequent immunoblotting procedures were performed using a chemiluminescence process as per the manufacturer's instructions. To detect the autophagic flux, the expression level of LC3-II was detected in a quercetin-treated cell with or without 2 h pretreatment of 200 nM Baf A1. To detect the ROS generation in quercetin-treated cells, ROS indicator H2 DCFDA was utilized as described. Briefly, cells after the indicated treatments were stained with 1 μM H2 DCFDA, and the fluorescence was measured using the flow cytometer. In some experiments, the cells were pretreated with N-acetyl cysteine (NAC), Baf A1, or Z-VAD-FMK for 2 h before quercetin exposure and analysis of ROS generation. The protein levels in cells were examined using Western blot analysis as described for immunoblotting for LC3-II. The intensity of the immunoreactive bands was determined by densitometry scanning using ImageJ software (). The results are expressed as the means ± standard deviation (SD) of three independent experiments. The data are expressed as the means ± SD from triplicated experiments. The statistical evaluation was determined using a two-tailed Student's t-test; and the differences were considered statistically significant at P < 0.05. All analyses were carried out using SigmaPlot Version 10.0 (Systat Software Inc., Chicago, IL, USA). The cell viability in cells upon quercetin treatment was accessed by WST-1 reagent to demonstrate the cytotoxic effects of quercetin. 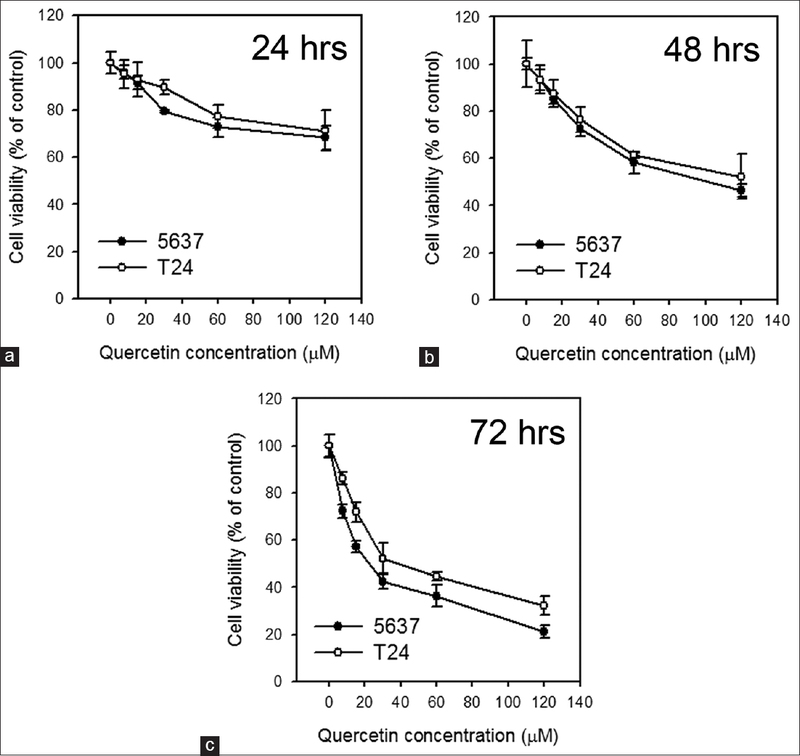 As shown in [Figure 1], quercetin reduced 5637 and T24 cell viability in a dose- and time-dependent manner. A significant decreasing in cell viability was observed after 48 and 72 h of incubation at concentrations over 40 and 60 μM, respectively. The results indicated that quercetin led to an inhibition of cell proliferation, and IC50 was shown in [Table 1]. The 5637 cells were more sensitive to quercetin at 72 h, with an IC50 of 47.91 μM after treatment. To access the quercetin-induced apoptosis, caspase 3/7 activity was detected in cells exposed to quercetin (0–120 μM) at 24, 48, and 72 h. In accordance with the decreased cell viability, the caspase 3/7 activity in quercetin-treated cells increased gradually according to the treatment doses and durations [Figure 2]a. In addition, the percentage of subG0/G1 cells and the TUNEL-positive cells were increased in 5637 and T24 cells treated with 60 or 120 μM quercetin [Figure 2]b and [Figure 2]c Furthermore, pretreatment of 1 mM Z-VAD-FMK attenuated quercetin-reduced cell viability in 5637 and T24 cells [Figure 2]d, indicating quercetin induces apoptotic cell death in these BC cells. Figure 2: Cytotoxicity induced by quercetin was through the induction of apoptotic cell death. (a) The caspase 3/7 activity was detected in 5637 and T24 cells treated with indicated concentrations of quercetin for 24, 48, and 72 h. (b) The percentage of sub G0/G1 cells was measured in cells treated with 0, 60, and 120 μM quercetin (c) The level of DNA fragmentation was detected in cells treated with 0, 60, and 120 μM quercetin. (d) The cell viability in 60 μM quercetin-treated cells with or without 2 h pretreatment of 1 mM Z-VAD-FMK, a pan-caspase inhibitor, was detected. Our results showed that quercetin-induced cell apoptosis at 48 and 72 h posttreatment obviously. Previous studies have indicated that quercetin induces protective autophagy and apoptosis in various cancer cells.,, We hypothesize that quercetin may also exert dual roles in apoptosis and protective autophagy. To test this hypothesis, the autophagic marker protein, LC3-II, was detected in cells treated with 0–120 μM quercetin for 24 h. The result showed that quercetin-induced moderate apoptosis and might be caused by protective autophagy effect. 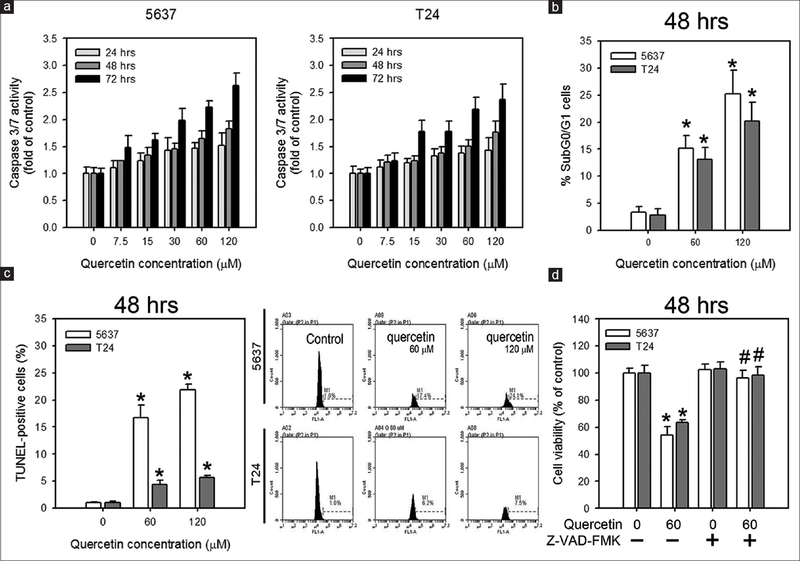 As shown in [Figure 3]a, the processing of LC3-II was gradually increased on increasing the concentrations of quercetin, suggesting the formation of autophagosomes in the quercetin-treated 5637 and T24 cells. Furthermore, an autophagy inhibitor, Baf A1 which inhibits the fusion of autophagosomes to lysosomes, caused significant accumulation of cellular LC3-II in quercetin-treated cells [Figure 3]b in BC cells. These results indicate that quercetin induces autophagy in 5637 and T24 cells. To understand the role of quercetin-induced autophagy in these BC cells, the cell viability in quercetin-treated cells with or without 2 h pretreatment of Baf A1 was detected. The suppression of quercetin-induced autophagy by Baf A1 resulted in the decreased cell viability, suggesting that quercetin-induced autophagy serves as a protective role in these BC cells on quercetin treatment [Figure 4]. We next detected the level of apoptosis in quercetin-treated cells with or without the pretreatment of autophagy inhibitor, Baf A1. 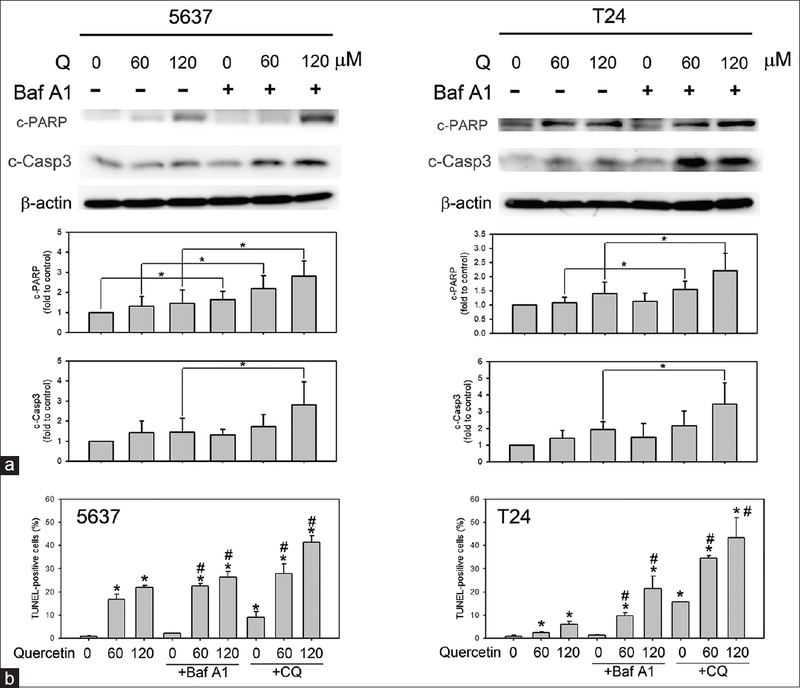 As shown in [Figure 5]a, cells with or without 200 nM Baf A1 pretreatment were treated with 60 or 120 μM quercetin for 24 h; then, the expression levels of cleaved PARP and cleaved caspase 3 (c-Casp3) were detected by Western blot. The results indicated that proapoptotic markers were increased by pretreatment with Baf A1. These finding revealed that inhibition of quercetin-induced autophagy promoted apoptosis and confirmed that quercetin-induced autophagy in BC cells. Furthermore, we detected the DNA fragmentation in quercetin-treated cells with or without autophagy inhibitors, Baf A1 or chloroquine (CQ), at 48 h posttreatment. As shown in [Figure 5]b, the levels of TUNEL-positive cells were significantly increased in quercetin-treated cells pretreated with both autophagy inhibitors. These results demonstrated that suppression of autophagy enhanced the apoptosis induction judged by the increased levels of pro-apoptotic proteins and DNA fragmentation. In summary, suppression of quercetin-induced autophagy significantly enhances the quercetin-induced cytotoxicity by elevating the apoptosis. Quercetin has been reported to generate ROS and causes free radical-induced apoptosis through the AMPK/p38 and AMPK/COX2 pathway. Our previous study demonstrated that autophagy induction was mediated by ROS in BC cells. It is possible that autophagy induction in quercetin-treated cells was mediated through the generation of ROS. To test this hypothesis, cell viability was detected at 48 h posttreatment in a quercetin-treated cell with or without the pretreatment of a ROS scavenger, NAC. As shown in [Figure 6]a, pretreatment of NAC attenuated the loss of cell viability in quercetin-treated cells. 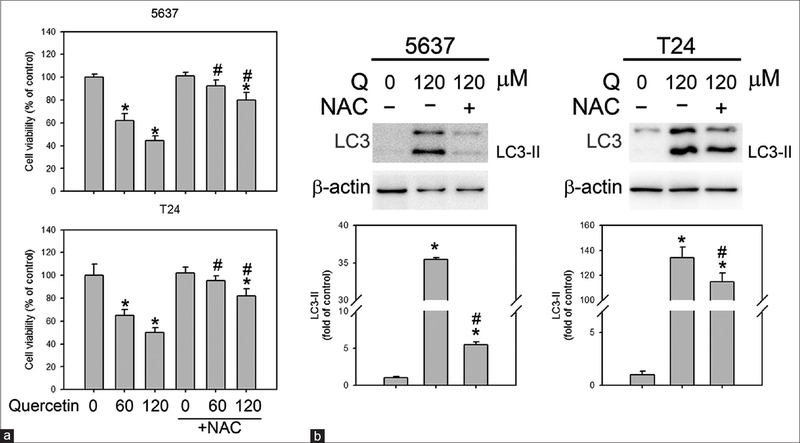 Moreover, NAC pretreatment also attenuated the processing of LC3-II autophagic protein [Figure 6]b, suggesting that quercetin-induced autophagy is initiated, at least partially, by ROS generation. BC is one of the main malignancies in the genitourinary tract., The major problem of BC is that even with the routine surveillance, repeated TURBT and the use of intravesical agents such as BCG, there is still a subset of patients who progress from NMIBC to MIBC that drive the mortality of this disease. When new treatment regimens are developed rapidly to manage other types of cancer, the treatment option for BC is still limited. For this reason, there are many research groups which have studied the natural products generated from the secondary metabolism of plants aiming to find novel treatments against BC. Quercetin exists in nearly all plants has been a part of the human diet for a long time. Accumulating studies demonstrate that quercetin exerts biological and pharmacological activities that are beneficial to human health. Such characteristics including the selective antiproliferative effect and cytotoxicity through the induction of apoptosis in cancer cell lines. For example, quercetin has been reported to inhibit the invasion, migration, and proliferation in prostate cancer cells, but with minimal impact on normal prostate epithelial cells. Quercetin is also reported to be effective against the primary culture of papillary urothelial carcinoma through inhibiting cell proliferation and colony formation through inducing DNA damage. In the present study, we found that cell proliferation in quercetin-treated cells was significantly suppressed at 48 and 72 h posttreatment. We also evaluated and confirmed that quercetin-induced apoptosis in BC cells. The administration of Z-VAD-FMK attenuated quercetin-decreased cell viability suggested that apoptotic cell death is responsible for quercetin-induced cytotoxicity. Recently, the cytotoxicity study of quercetin and its derivative on BC cells have been investigated. The result showed that quercetin has a moderate cytotoxic effect on normal bladder cells. The IC50 of quercetin against BC cells was reported to be ~60 μM. The higher dose (60 and 120 μM) of quercetin used in this study could help us to develop quercetin as an intravesical chemotherapy reagent with fewer systemic side effects. In the current study, we demonstrate that quercetin induces protective autophagy in human BC cells. At 24 h posttreatment, the expression of LC3-II was increased dose-dependently in quercetin-treated cells. 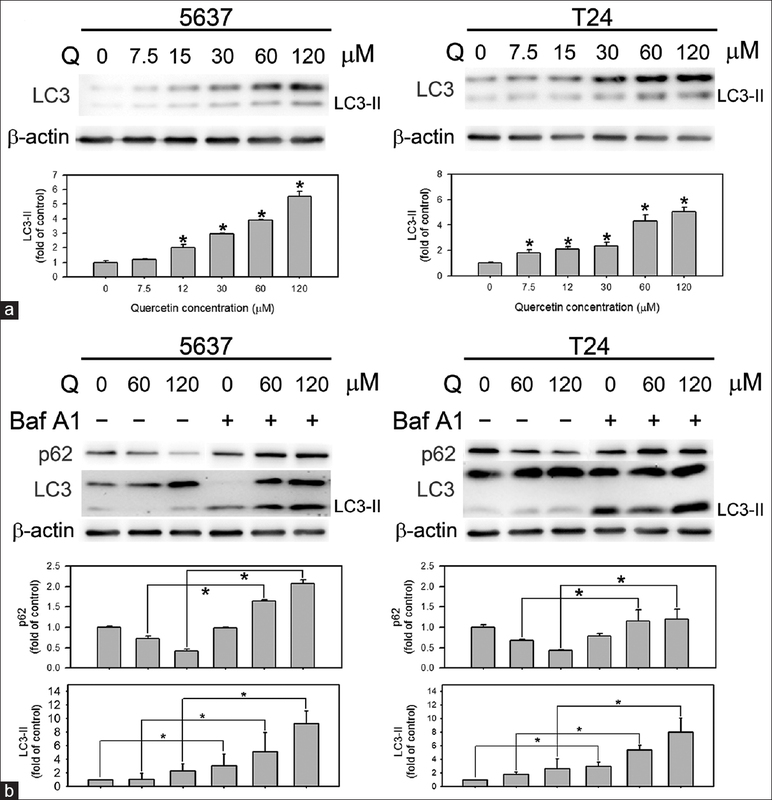 The inhibition of quercetin-induced autophagy using Baf A1 resulted in significant accumulation of LC3-II and p62 protein, indicating a disruption of autophagic flux in quercetin-treated cells. It has been reported that quercetin induces autophagy in colon, gastric, breast, cervical, ovarian, and B-lymphoblastoid cancer cells.,, Similar to the Wang et al. study, our results revealed that quercetin-induced apoptosis and autophagy in BC cells. Moreover, Baf A1 pretreatment further decreased the cell viability, suggesting a protective role of quercetin-induced autophagy. These results are in agreement with the previous finding of the Wei et al., suggesting that quercetin elicits protective autophagy in BC cells. The administration of autophagy inhibitors including Baf A1 or CQ enhanced the quercetin-induced apoptosis detected by the elevated levels of cleaved PARP, c-Casp3, and DNA fragmentation. The previous study has shown that Baf A1 could induce apoptosis in osteosarcoma cells. In accordance with this report, our data showed that Baf A1 has a little effect on cell viability at a lower concentration. Moreover, pretreatment with Baf A1 decreased cell viability in BC cells, especially in T24 cells. This result may be caused by the high basal level of autophagy in T24 cell. In cancer-associated fibroblast cells, quercetin treatment has been demonstrated to promote the removal of defective mitochondria which is induced by oxidative stress, resulting in the “reverse Warburg effect” whereby these fibroblasts provided nutrients to stimulate mitochondrial biogenesis and oxidative metabolism in adjacent cancer cells. Taken together, quercetin induces protective autophagy in different types of cancer, and our data strongly suggest that inhibiting quercetin-induced autophagy enhances apoptotic cell death in human BC cells. Quercetin is ubiquitously present in foods including vegetables, fruit, tea, and wine as well as in many food supplements and considered to be one of the most prominent dietary antioxidants. However, our data suggested that quercetin-induced ROS generation was responsible for the induced cytotoxicity and autophagy in human BC cells. Consistent with our finding, quercetin has been reported to induce ROS production which involves in quercetin-induced apoptosis in human hepatoma cells. Quercetin is demonstrated to increase intracellular ROS levels by forming quercetin-radicals after peroxidase-catalyzed oxidation to scavenge reactive peroxyl radicals. On the other hand, quercetin can alter ROS metabolism by inhibiting the intracellular pool of glutathione. In several models, quercetin-induced glutathione depletion resulted in apoptosis induction through mitochondria depolarization. The regulatory role for ROS of mitochondrial origin as signaling molecules in autophagy to either survival or cell death has been discussed previously. The moderate ROS level induces mitophagy to promote cell survival. However, accumulation of ROS may also trigger apoptosis pathway. Whether quercetin-induced ROS generation leads to mitochondria damages that are responsible for apoptosis and autophagy induction needs further investigation. In conclusion, the results of this study show the antiproliferative potential of quercetin on BC cells by inducing apoptotic cell death. Utilizing the autophagy and ROS inhibitors, we showed that quercetin induces ROS-initiated autophagy which acts as a protective role in human BC cells. Since our previous study showed that a high basal level of autophagic activity was found in human BC cell lines., these results suggest that combined treatment of autophagy inhibitor which sensitizes cells to quercetin treatment may be a better therapeutic approach to reduce BC cells proliferation. This study was supported by Shin Kong Wu Ho-Su Memorial Hospital (SKH-8302-103-DR-13 and SKH-8302-104-0202 to TFT; and SKH-8302-103-NDR-06 and SKH-8302-104-NDR-09 to JFL) and Ministry of Science and Technology (NSC102-2314-B-341-003-MY3 to JFL), Taipei, Taiwan. Babjuk M. Optimized management in patients with bladder cancer. Cent European J Urol 2015;68:15-6. Rouprêt M, Babjuk M, Compérat E, Zigeuner R, Sylvester RJ, Burger M, et al. European association of urology guidelines on upper urinary tract urothelial cell carcinoma: 2015 update. Eur Urol 2015;68:868-79. Murakami A, Ashida H, Terao J. Multitargeted cancer prevention by quercetin. Cancer Lett 2008;269:315-25. Grosso A, de Sousa RC. Quercetin enhances water transport in toad bladder. Experientia 1981;37:742-4. Ma L, Feugang JM, Konarski P, Wang J, Lu J, Fu S, et al. Growth inhibitory effects of quercetin on bladder cancer cell. Front Biosci 2006;11:2275-85. Rockenbach L, Bavaresco L, Fernandes Farias P, Cappellari AR, Barrios CH, Bueno Morrone F, et al. Alterations in the extracellular catabolism of nucleotides are involved in the antiproliferative effect of quercetin in human bladder cancer T24 cells. Urol Oncol 2013;31:1204-11. Mathew R, Karantza-Wadsworth V, White E. Role of autophagy in cancer. Nat Rev Cancer 2007;7:961-7. Yoshinori Ohsumi – Facts, Nobel Media AB 2014; 2017. Available from: http://www.nobelprize.org/nobel_prizes/medicine/laureates/2016/ohsumi-facts.html. [Last updated on 2017 Mar 13]. Kondo Y, Kanzawa T, Sawaya R, Kondo S. The role of autophagy in cancer development and response to therapy. Nat Rev Cancer 2005;5:726-34. Lin JF, Lin YC, Tsai TF, Chen HE, Chou KY, Hwang TI, et al. Cisplatin induces protective autophagy through activation of BECN1 in human bladder cancer cells. Drug Des Devel Ther 2017;11:1517-33. Lin YC, Lin JF, Wen SI, Yang SC, Tsai TF, Chen HE, et al. Inhibition of high basal level of autophagy induces apoptosis in human bladder cancer cells. J Urol 2016;195:1126-35. Lin JF, Lin YC, Yang SC, Tsai TF, Chen HE, Chou KY, et al. Autophagy inhibition enhances RAD001-induced cytotoxicity in human bladder cancer cells. Drug Des Devel Ther 2016;10:1501-13. Klionsky DJ. Coming soon to a journal near you – The updated guidelines for the use and interpretation of assays for monitoring autophagy. Autophagy 2014;10:1691. Klionsky DJ. Autophagy: From phenomenology to molecular understanding in less than a decade. Nat Rev Mol Cell Biol 2007;8:931-7. Su Q, Peng M, Zhang Y, Xu W, Darko KO, Tao T, et al. Quercetin induces bladder cancer cells apoptosis by activation of AMPK signaling pathway. Am J Cancer Res 2016;6:498-508. Lin YC, Lin JF, Wen SI, Yang SC, Tsai TF, Chen HE, et al. Chloroquine and hydroxychloroquine inhibit bladder cancer cell growth by targeting basal autophagy and enhancing apoptosis. Kaohsiung J Med Sci 2017;33:215-23. Lin JF, Tsai TF, Yang SC, Lin YC, Chen HE, Chou KY, et al. Benzyl isothiocyanate induces reactive oxygen species-initiated autophagy and apoptosis in human prostate cancer cells. Oncotarget 2017;8:20220-34. Lin JF, Lin YC, Lin YH, Tsai TF, Chou KY, Chen HE, et al. Zoledronic acid induces autophagic cell death in human prostate cancer cells. J Urol 2011;185:1490-6. Lin JF, Tsai TF, Liao PC, Lin YH, Lin YC, Chen HE, et al. Benzyl isothiocyanate induces protective autophagy in human prostate cancer cells via inhibition of mTOR signaling. Carcinogenesis 2013;34:406-14. Schindelin J, Rueden CT, Hiner MC, Eliceiri KW. The imageJ ecosystem: An open platform for biomedical image analysis. Mol Reprod Dev 2015;82:518-29. Wang K, Liu R, Li J, Mao J, Lei Y, Wu J, et al. Quercetin induces protective autophagy in gastric cancer cells: Involvement of akt-mTOR- and hypoxia-induced factor 1α-mediated signaling. Autophagy 2011;7:966-78. Liu Y, Gong W, Yang ZY, Zhou XS, Gong C, Zhang TR, et al. Quercetin induces protective autophagy and apoptosis through ER stress via the p-STAT3/Bcl-2 axis in ovarian cancer. Apoptosis 2017;22:544-57. Kim H, Moon JY, Ahn KS, Cho SK. Quercetin induces mitochondrial mediated apoptosis and protective autophagy in human glioblastoma U373MG cells. Oxid Med Cell Longev 2013;2013:596496. Lee YK, Hwang JT, Kwon DY, Surh YJ, Park OJ. Induction of apoptosis by quercetin is mediated through AMPKalpha1/ASK1/p38 pathway. Cancer Lett 2010;292:228-36. Formica JV, Regelson W. Review of the biology of quercetin and related bioflavonoids. Food Chem Toxicol 1995;33:1061-80. Senthilkumar K, Arunkumar R, Elumalai P, Sharmila G, Gunadharini DN, Banudevi S, et al. Quercetin inhibits invasion, migration and signalling molecules involved in cell survival and proliferation of prostate cancer cell line (PC-3). Cell Biochem Funct 2011;29:87-95. Oršolić N, Karač I, Sirovina D, Kukolj M, Kunštić M, Gajski G, et al. Chemotherapeutic potential of quercetin on human bladder cancer cells. J Environ Sci Health A Tox Hazard Subst Environ Eng 2016;51:776-81. Tao T, He C, Deng J, Huang Y, Su Q, Peng M, et al. A novel synthetic derivative of quercetin, 8-trifluoromethyl-3,5,7,3',4'-O-pentamethyl-quercetin, inhibits bladder cancer growth by targeting the AMPK/mTOR signaling pathway. Oncotarget 2017;8:71657-71. Klappan AK, Hones S, Mylonas I, Brüning A. Proteasome inhibition by quercetin triggers macroautophagy and blocks mTOR activity. Histochem Cell Biol 2012;137:25-36. Psahoulia FH, Moumtzi S, Roberts ML, Sasazuki T, Shirasawa S, Pintzas A, et al. Quercetin mediates preferential degradation of oncogenic ras and causes autophagy in Ha-RAS-transformed human colon cells. Carcinogenesis 2007;28:1021-31. Wei L, Liu JJ, Cao J, Du NC, Ji LN, Yang XL, et al. Role of autophagy in quercetin-induced apoptosis in human bladder carcinoma BIU-87 cells. Zhonghua Zhong Liu Za Zhi 2012;34:414-8. Xie Z, Xie Y, Xu Y, Zhou H, Xu W, Dong Q, et al. Bafilomycin A1 inhibits autophagy and induces apoptosis in MG63 osteosarcoma cells. Mol Med Rep 2014;10:1103-7. Boots AW, Haenen GR, Bast A. Health effects of quercetin: From antioxidant to nutraceutical. Eur J Pharmacol 2008;585:325-37. Chang YF, Hsu YC, Hung HF, Lee HJ, Lui WY, Chi CW, et al. Quercetin induces oxidative stress and potentiates the apoptotic action of 2-methoxyestradiol in human hepatoma cells. Nutr Cancer 2009;61:735-45. Jeong JH, An JY, Kwon YT, Rhee JG, Lee YJ. Effects of low dose quercetin: Cancer cell-specific inhibition of cell cycle progression. J Cell Biochem 2009;106:73-82. Ramos AM, Aller P. Quercetin decreases intracellular GSH content and potentiates the apoptotic action of the antileukemic drug arsenic trioxide in human leukemia cell lines. Biochem Pharmacol 2008;75:1912-23. Lugli E, Troiano L, Ferraresi R, Roat E, Prada N, Nasi M, et al. Characterization of cells with different mitochondrial membrane potential during apoptosis. Cytometry A 2005;68:28-35. Scherz-Shouval R, Elazar Z. ROS, mitochondria and the regulation of autophagy. Trends Cell Biol 2007;17:422-7.